This will be my second conflict of interest post this year as I am writing about another record that I'm releasing on PopKid records, the label I do with my buddy Alan. I never really expected that we would be releasing another record so soon after putting out Chestnut Road a couple of months ago. That had been the first PopKid record in twelve years. I think you have to go back to 1999 to find the last year that PopKid had put out two releases in the same year. The thing about is we just couldn't not put this record out. 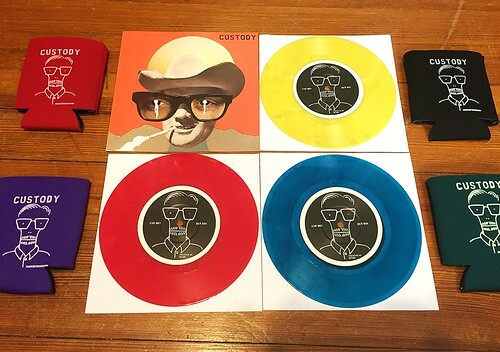 I had written a few nice things about the first Custody 7" on this website. It was a great record then and it's still in my frequent rotation. The guys in Custody got in touch to see if PopKid wanted to be the American label for their next 7". We were flattered, but weren't sure we really should fire up another record so soon after the last. All it took was a few listens to these songs and we were hooked. We HAD to release this 7". The A side "Blistered Soul" kicks things off with its palm muted Samiam inspired verse that chugs along as it builds towards the chorus. When that chorus hits, the hook just explodes into life with a vocal melody that gets lodged in my head for days on end. The guitar work roars along side the vocals with a rich, full sound that kills me every time. Perhaps a result of the bang up mastering job done by Mass Giorgini at Sonic Iguana? I'm sure he didn't hurt things! For me personally, the B side "Whatever We Decide" takes the cake on this 7". I can say with no hyperbole whatsoever that this is one of my favorite songs I've heard all year. When the chorus of this song kicks in, you're treated with some of the most dynamic guitar work this side of Starmarket. The way the band is able to weave these guitar leads through the vaguely Iron Chic style passionate vocals is just amazing to me. Sure, I may have bias because this record is coming out on my label, but the reason it is is because we just love these two songs. I hope that Custody keeps cranking out hits forever. I consider us very lucky to be able to be a part of this release and I can only hope that we will be able to do more with them in the future. Surely a full length will be needed at some point, right?